The Geforce GTX 1080 tops the performance of the $1,000 Titan X card for $700. The Geforce GTX 1070 basically matches it for under $400. That’s just nuts. Easily living up to the label of the most powerful graphics card yet, the Pascal powered Geforce GTX 1080 has been getting the lion’s share of attention since Nvidia announced it earlier this month. But the benefits of more efficient operation, smaller die size and advanced architecture were also gifted to the Geforce GTX 1070. It may not be Nvidia’s new flagship card, but it still keeps pace (and sometimes surpasses) the company’s former flagship at less than half the cost. By jumping ahead to technology generations, Nvidia has stomped all over its previous power elite. 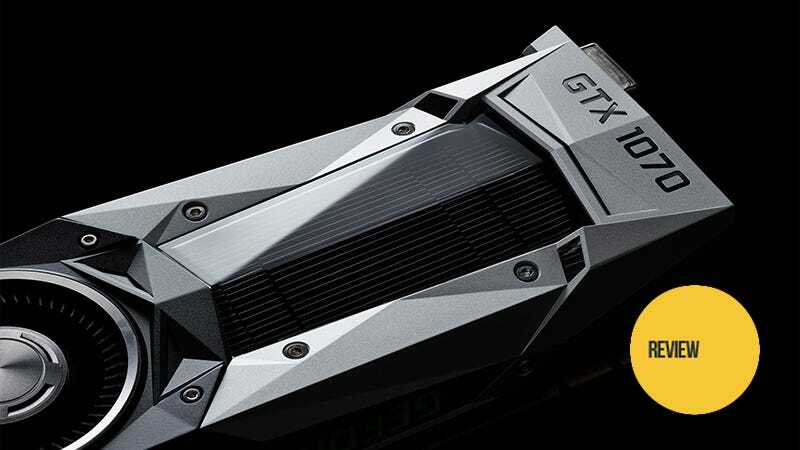 The poor, poor Titan X, with its $1,000 plus price tag, is going to need a substantial discount if anyone is going to buy one once the Geforce GTX 1070s drop on June 10. I had some time to play with the Founder’s Edition Geforce GTX 1070 over the past week, removing the 1080 I’d reviewed previously and replacing it with a less powerful card, which is never a good feeling. It helped that the exterior of the card is essentially the same faceted deign of its big brother. It’s quite a bit different on the inside, however. The vapor chamber cooling system of the 1080 is replaced with a heat pipe assembly. While the 1070 is based on the same GP104 GPU as the 1080, it’s got fewer CUDA cores to play with (1920 versus 2560), fewer texture units (120 versus 160) and boasts slower clock speeds (core 1506 MHz versus 1607 MHz.) And while the 1080 features new 10Gbps GDDR5X memory, the 1070 sticks with 8GB of good old GDDR5 running at 8Gbps. Check out full specs at Nvidia’s official page. Despite the hardware differences, the GTX 1070 is still a Pascal-based graphics card, featuring all of the bells and whistles that comes with—simultaneous multi-projection, fast sync for older games that want to run way too speedy, support for Nvidia’s Ansel 360 degree screenshot technology and a relatively easy overclocking experience (as long as you don’t mind fan noise). So while the GTX 1070 might not be quite as advanced as the more expensive 1080, it still delivers next-generation GPU technology at a much nicer price. Mind you the Founder’s Edition card I played with runs $450 as part of Nvidia’s ‘let’s charge more for our reference models’ initiative. Third-party cards are expected to retail at $380, and who knows what sort of bells and whistles they’ll be screwing onto these puppies. Whether you opt to pay the extra $70 or not, you’re getting an outstanding price versus performance ratio with the Geforce GTX 1070. I tested the same seven games I did with the 1080 on highest settings, and the numbers were pretty much on par with benchmarks for the $1,000 Geforce GTX Titan X. Once again I didn’t bother listing 1920 x 1080 scores, as the 1070 readily surpassed the 60 frames per second target for everything I threw at it—even Metro Last Light, the most dickish of benchmarks. Passable 2560 x 1440 performance on all but two games, which again is right on par with the Titan X. It’s nowhere near the 4K powerhouse of the GTX 1080, but for the price it’s still a hell of a card. Unfortuantely I did not have a Titan X on hand to compare, but our friends at Techspot put the 1070 up against it and a slew of other cards. Here’s a taste. Most of the comparison benchmarks at Techspot tell the same tale. The Titan X and its much cheaper sibling neck-and-neck at every turn, with the Radeon R9 Fury X dancing around them. With a power versus price ratio that’s through the roof, the Nvidia Geforce GTX 1070 is primed to become one of the most popular graphics cards of this hardware generation. While the GTX 1080 is going to turn a lot of heads, the 1070 is the one that’s going to open wallets.